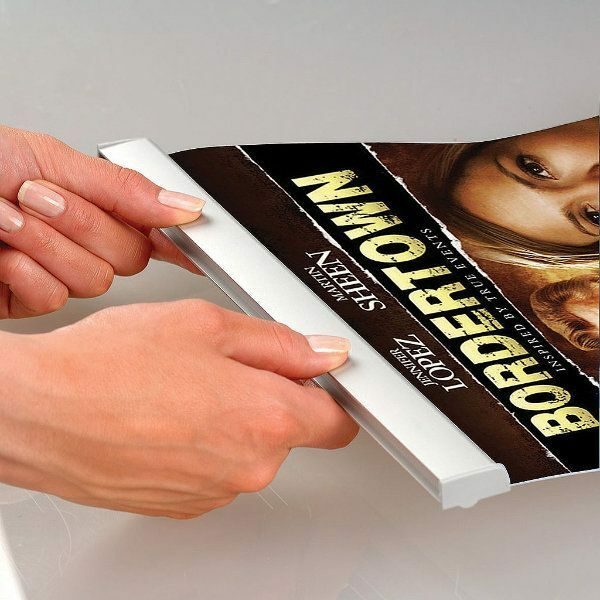 Packing Size: 2.36" x 32.68" x 1.77"
A newly created series of poster clamps offers competitive solutions. 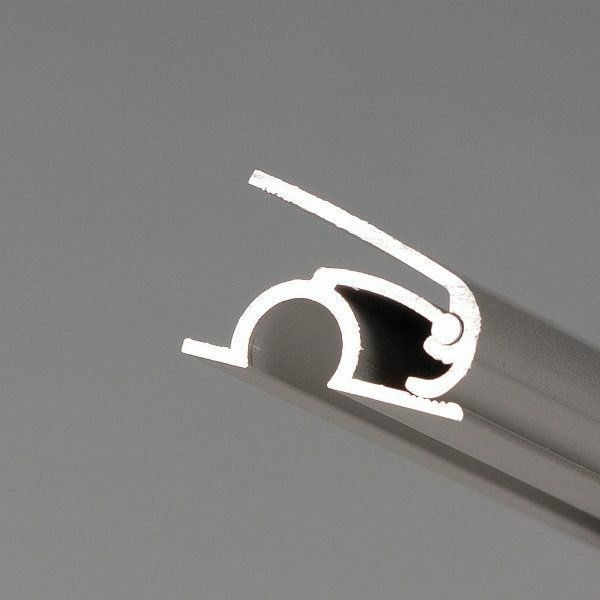 Suitable for posters in thickness 50 micron / 500 micron. Single packed as set in plastic bags. One set includes end caps on both profiles and hangers on the top profile. In top clamp 7/16 inch (10 mm) poster and in bottom clamp 7/16 inch (10 mm) poster is placed within the clamping system. Turning end caps help to slide the poster in. No tool assembly. Hangers are suitable for wall mounting and ceiling suspension. 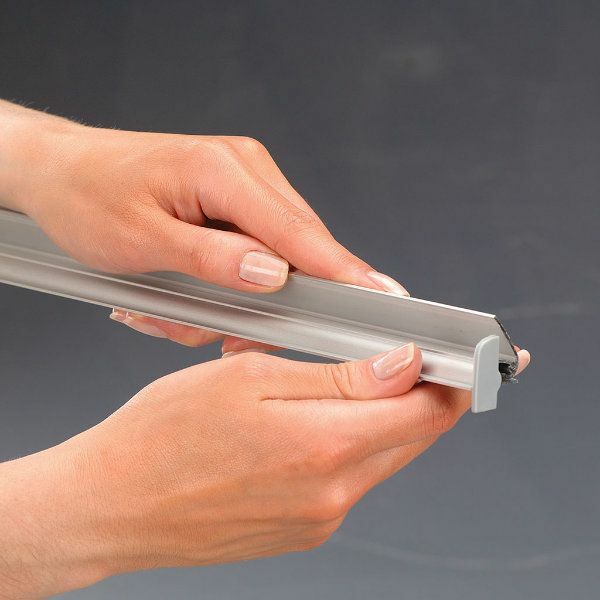 Moving hangers allow easy assembly. Product is not recommended for use in special sizes wider than 39 3/8 inch (1000 mm) and longer then 78 3/4 inch (2000 mm). Suitable for silk screen printing, max. letter height is 5/8 inch (15 mm). 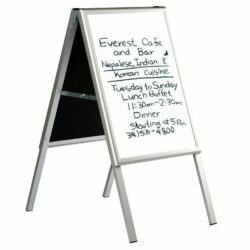 The sign hangers are designed for displaying your prints and both sides can hold your different images and are reasonably priced in comparison to conventional poster clamp hanging rails. Where to use these quick-to-change sign holders? 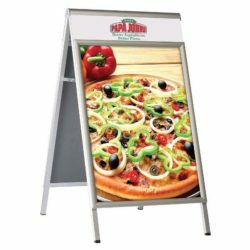 These poster clamp hanging rails are the perfect indoor hanging sign holders to display your posters to a wide audience both inside and outside of the shops, restaurants, markets, and many other retail environments as well as a wide range of public places such as schools, banks and theathers. 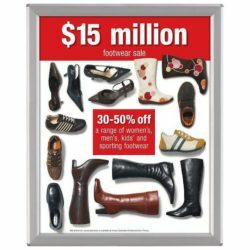 These window picture hanger displays are low cost hanging rails that have two rails at the bottom and top to make it effortless to place and change your images. 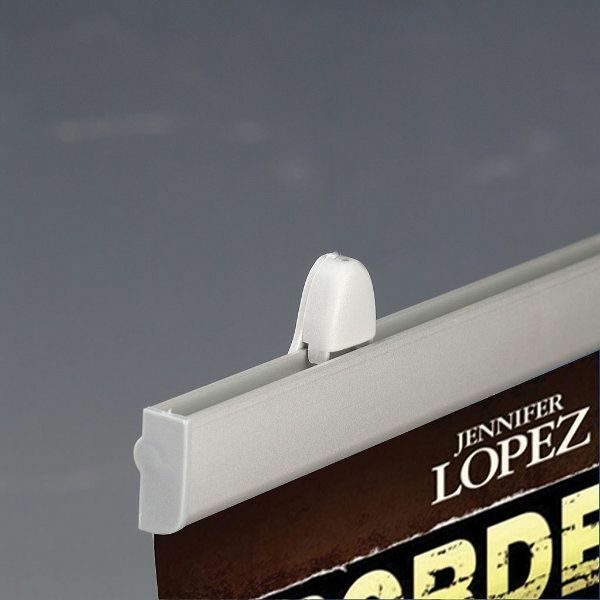 The poster clamp hanging rails are clipped tightly to the rails without risking dropping while widening the visibility range for your posters. This aluminum poster rail is a stylish, yet low cost banner with aluminum finish and easily opened profiles; there is no use of tools involved. 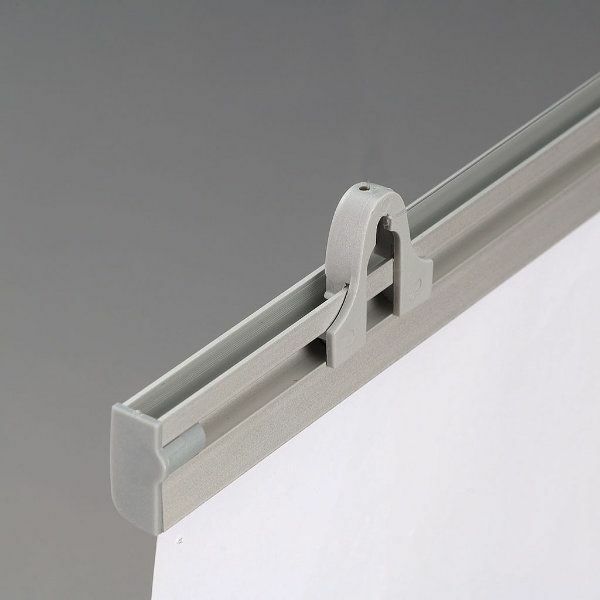 And the poster clamp hanging rails are designed as re-usable window picture hangers allowing you to display different posters for different needs. 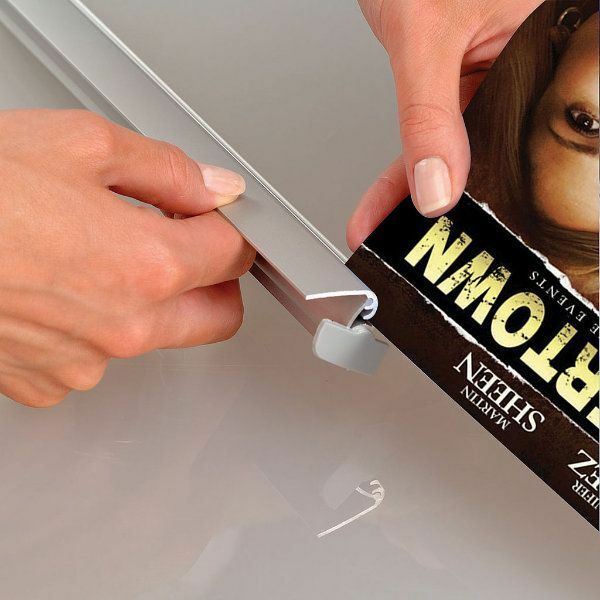 We offer you a wide range of banner grip models in different sizes convenient for all your hanging print needs and you can use these window picture hangers in front of your shop window with strings. Another option is using suction cups, since the banner grip is very light. 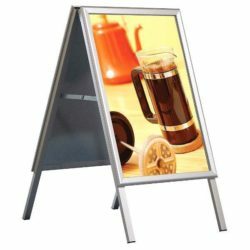 With its easily opened profiles and two sides that are suitable for displaying, this aluminum poster rail is a safe and smart choice as a banner grip for various public spaces as well as retail environments for all industries such as diners, groceries, post offices, pharmacies in big public spaces. The poster frame is perfect. 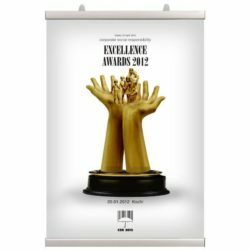 Easy to place poster between the slats. It hangs nicely.